In the last couple of weeks, I have been researching the children of Elizabeth Skempton, to determine whether there were more grandchildren than I had in my family tree. Last week, I focused on Elizabeth’s 6th child, Mary Ann Slawson, so this week, my research will be on the 7th child, Priscilla Slawson. Priscilla was christened 26 November 1848 at Geddington, Northamptonshire, England. 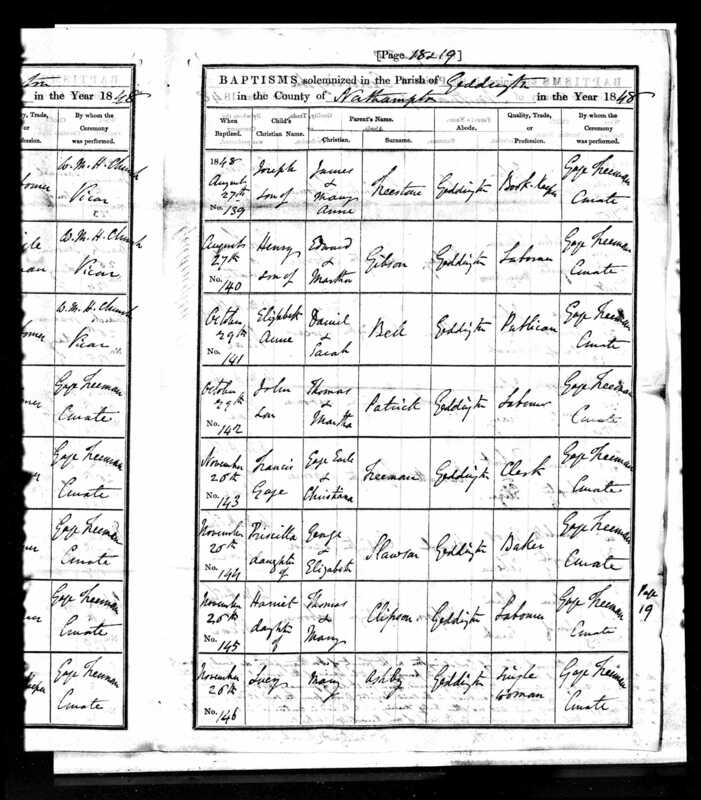 Ancestry.com, “Northamptonshire, England, Church of England Baptisms, 1813-1912,” database and images, Ancestry.com (http://home.ancestry.com.au/ : accessed 4 Jan 2017); entry for Priscilla Slawson, 26 Nov 1848, Geddington; Northamptonshire Record Office; Northampton, England; Register Type: Bishops Transcripts. Priscilla appeared with the rest of her family on the 1851 and 1861 censuses. In 1871 she was a lodger in the household of John Sharper. 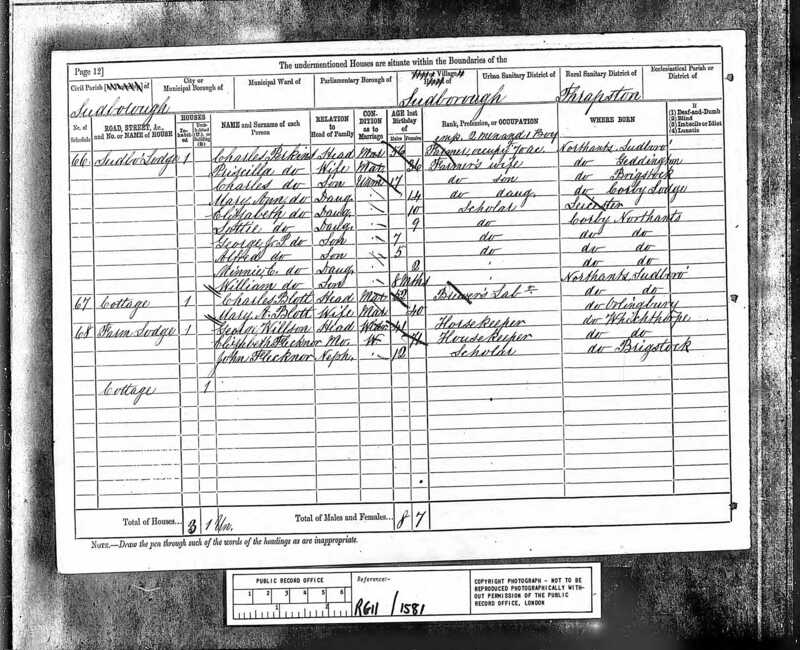 1871 census of England, St Margaret, Leicester, Leicestershire, folio 18, page 1, Priscilla Slawson, age 23, birthplace Geddington, Northampsonshire; digital images, ancestry.com, ancestry.com (http://home.ancestry.com.au/ : accessed 4 Jan 2017); citing PRO RG 10/3279. This census showed that Priscilla had an illegitimate daughter, Elizabeth, born about 1870. A Priscilla Slawson married Charles Perkins in 1879 in the Market Harborough district. Was this our Priscilla, and was this the same Charles who had married Priscilla’s sister Mary Ann? The 1881 England Census showed the following household of Charles and Priscilla Perkins at Sudborough, Northamptonshire. 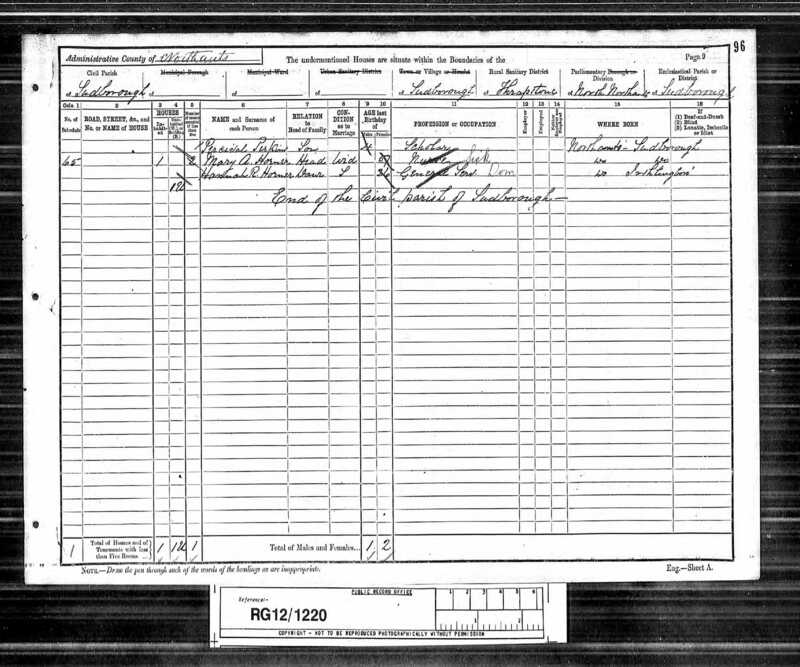 1881 census of England, Sudborough, Northamptonshire, folio 9, page 12, Priscilla Perkins, age 36, birthplace Geddington, Northamptonshire, England; digital images, Ancestry.com Operations Inc., ancestry.com.au (http://home.ancestry.com.au/ : accessed 4 Jan 2017); citing PRO RG 11/1581. The 1891 Census showed Charles and Priscilla still living in Sudborough. 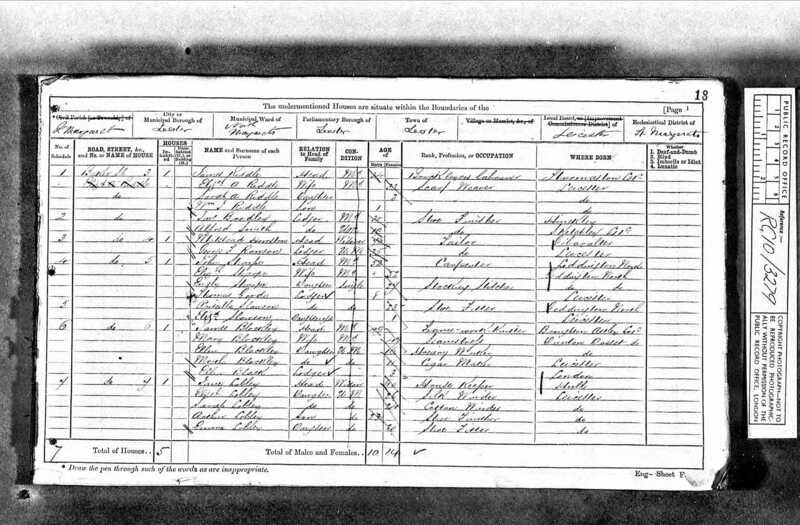 1891 census of England, Sudborough, Northamptonshire, folio 95, page 8, Priscilla Perkins, age 44, birthplace Northants, Geddington; digital images, ancestry.com, ancestry.com (http://home.ancestry.com.au/ : accessed 4 Jan 2017); citing PRO RG 12/1220. 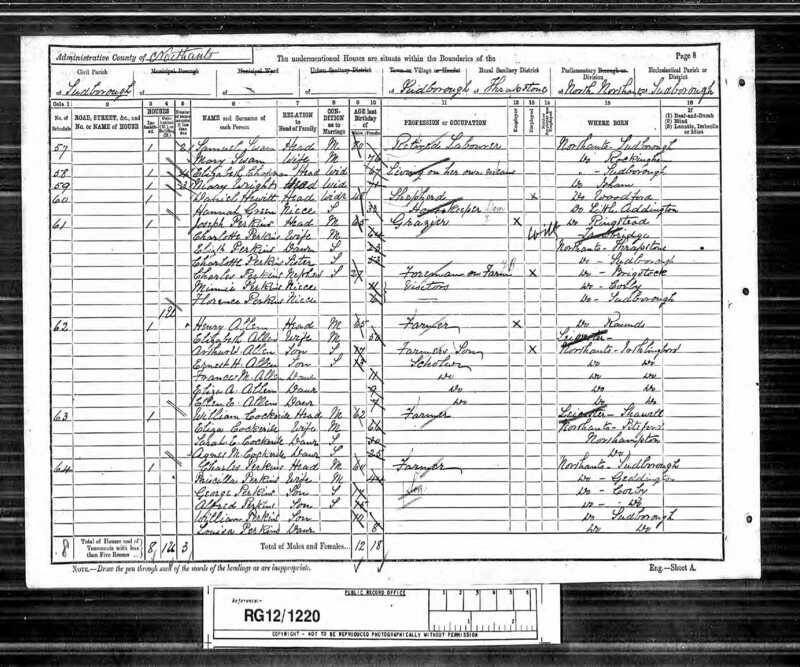 1891 census of England, Sudborough, Northamptonshire, folio 96, page 9, Percival Perkins, age 4, birthplace Northants, Sudborough; digital images, ancestry.com, ancestry.com (http://home.ancestry.com.au/ : accessed 4 Jan 2017); citing PRO RG 12/1220. I haven’t been able to find Priscilla (or Charles) on the 1911 census yet. Priscilla died 7 March 1920. Public Record Office, UK, “England & Wales, National Probate Calendar (Index of Wills and Administrations),1861-1941,” database, ancestry.com.au (http;//www.ancestry.com.au/ : accessed 4 Jan 2017), entry for Priscilla Perkins, died 7 March 1920; probate date 19 June 1920 London, England. Her daughter Minnie Ellen Perkins married Arthur Bell Dalby in 1906 (Apr-May-Jun quarter, Newbury district, vol 2c page 546), and her daughter Elizabeth Perkins married Frederick William Trueman in 1917 (Jul-Aug-Sep quarter Newbury district vol 2c page 583).